If you do not like to stay in the dark in Minecraft 1.7.2a nd 1.7.10, take a flashlight or better a portable lamp. 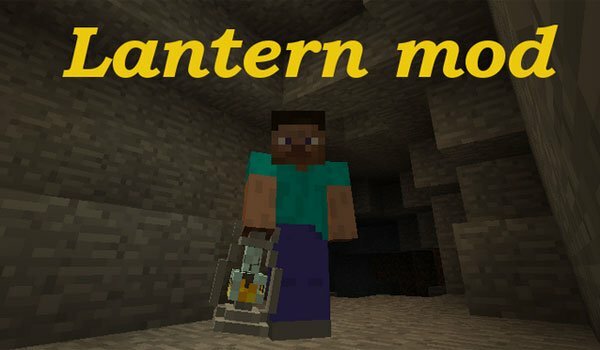 Lantern Mod 1.7.2 and 1.7.10 is a fairly simple mod that adds two kinds of portable lamp to Minecraft, so you can explore the caves without having to use torches. This mod was created by the Cave-Gen mod’s author, in order to complete this one but later on he decided separate the lamp of the mod in case someone wanted to use only the lamp, but not the mod. This two lamps are the same, the only difference lies in its manufacturing recipe, since one is designed to work with the Cave-Gen mod and the other without it. The lamps can be hung from the ceiling or can be left on any block to light. The path will be illuminated while you have hold the lamp with your hand. How to install Lantern Mod for Minecraft 1.7.2 and 1.7.10? Portable lamps to illuminate caves and interiors in Minecraft!